So you’re looking to lose weight. Who isn’t nowadays, with the taunting images of perfectly airbrushed supermodels on every television screen and magazine cover? It’s a wonder Americans spend an estimated $42 billion dollars each year on weight loss foods and products, most of which don’t even hold true to their advertised promise of weight loss or health benefits. The over abundance of diet “fads” often leaves us stress eating while deciding which diet to start! So, how do you choose? Should you carbo-load or cut the carbs completely? Should you go on an all water cleanse or the cookie diet? Maybe it’s all too confusing so you consider skipping meals to melt away the pounds? (which is highly unrecommended). In this post we will discuss a few of the most popular dieting trends, their overall focus, course of action, and how they rank on the scale of effectiveness. So how do we, average Americans, find a “healthy” plan or product we can trust? Sources such as The American Dietetic Association’s (ADA) website at http://www.eatright.org, can help us distinguish between legitimate products and those made popular by hype rather than effectiveness. The ADA website gives five product claims or features in which a consumer should look out for in order to avoid weight loss scams that dominate the market. That being said, let’s take a look at a few of the popular diet trends in today’s market and see how these rules apply. The weight loss programs and media that have in the past and still are getting all the attention include, but are not limited to: “TheAtkins Diet,” “The South Beach Diet,” “Weight Watchers,” “The Mediterranean Diet.” Let’s break these down shall we? Created by cardiologist Dr. Robert Atkins, this diet primarily focuses on the much-practiced idea of decreasing one’s carbohydrate intake. (Low Carb Diet). Now comes into play the misconception that all carbs are bad, which is a myth we will bust in upcoming postings. The Atkins Diet focuses on eliminating bad carbs like sugars, high fructose corn syrup and flour, while eating the good complex carbs like whole grains. Unlike refined carbohydrates, good carbs are broken down and converted into glucose more slowly providing a steady stream of energy throughout the day. Phase 1: Induction: This phase is meant, “to switch your body from burning primarily carbohydrates (in the form of glucose) to burning primarily fat (including your body fat) for energy.” This is done by limiting your carbohydrate intake to 20 grams each day, making sure those 20 grams are complex carbs coming from foods rich in nutrients such as vegetables. Phase 2: Ongoing Weight Loss (OWL): In this phase the dieter will up their carb intake, keeping track of how many carbs they can consume while still losing weight. Simply stated, it’s the introduction back into the diet of acceptable OWL foods that are nutrient-dense and fiber rich. Phase 3: Pre-Maintenance: The dieter will slowly add 10 more net carbs each week back into their diet. This way they are able to find a personal consumable carbohydrate threshold that allows the maintenance of their new weight. Phase 4: Lifetime Maintenance: “This is where the dieter will commit to remaining at their goal weight from now on.” This is the phase where you must maintain your healthy eating habits and physical activity to keep the weight off. So how do we relate these four phases with the ADA’s five rules? From the research I’ve conducted, I would say they successfully avoid the use of scam terms. As far as the ADA’s rule number one, which recommends the avoidance of rapid weight loss promises, The Atkins Diet promotes gradual weight loss. So far, so good. Now on to rule 2. While the diet does give you a limited selection of foods, it does so in the proper sense, limiting not specific items but a broad category of unhealthy refined carbohydrates that leave you feeling tired and experiencing hunger pangs more quickly in between meals. This is a healthy diet recommended to everyone, not just those on The Atkins Diet. Another check in the positive box. The beginning stages may have warning signs due to the semi rigid menu, but further analysis shows that menu lightens up a bit in regulation as you gain control of your diet and advance on to further phases. Here’s the kicker. Regular Exercise. (groans and moans). Recall in phase four the words “maintain your healthy eating habits and physical activity.” I specifically included these words, which are read in The Atkins Diet plan, to acknowledge rule five from the ADA website. Overall, the diet doesn’t promise any magic weight loss and disappearing pounds. Instead, success is accomplished by changing a small portion of your diet to healthier alternatives and upping your physical activity. I can’t speak for the American Dietetic Association but I would say this diet satisfies their rules. Another Cardiologist designed carbohydrate aware diet created by Dr. Arthur Agatston M.D., The South Beach Diet, focuses not on limiting your carbohydrate intake numbers, but the types of carbohydrates you consume. As mentioned above, the good carbs are whole grains and fruits and vegetables, which are allowed in The South Beach Diet, actually insisted upon. Where The South Beach Diet differs fromThe Atkins Diet is in the fact that South Beach pushes not only for the substitution of good instead of bad carbs, but also good fats and lean proteins in exchange for the bad ones. Following the typical diet plan formula; The South Beach Diet has several phases beginning with the elimination of several foods, followed by the slow reintroduction of healthy alternatives to such foods. Phase 2: Lose Steadily: This phase title appeals greatly to rule 1 of the ADA’s diet plan guidelines. This is the stage where you slowly introduce GOOD carbs back into the diet and can enjoy certain snacks and desserts. Phase 3: Maintain for Life: Here is where the dieter has now adopted a healthy eating lifestyle that they will continue with throughout the rest of their lives continuing to maintain that healthy goal weight. The South Beach Diet, like The Atkins Diet, steers clear of the marketing traps the American Dietetic Association’s warns us about. Both diets promise gradual, not rapid weight loss, and don’t continuously limit your menu options, but allow you to reintroduce your favorite (healthy) foods, even offering a “supercharged fitness program” on their site! A+ for a well thought out eating plan Dr. Agatston. (Calories + (Fat x 4) – (Fiber x 10) / 50. Ok less simple for the mathematically challenged like myself, but still not rocket science and relatively easy enough to follow. So how does this particular diet rank on our ADA rule system? I would say better than most. This diet doesn’t promise magical weight loss or limit certain foods. In fact, it allows you to eat whatever you so choose, as long as the total intake doesn’t go above and beyond your allotted points. However, eating all your points in cake and cookies isn’t recommended and might just get you kicked out of the program. Named after the Southern European nutritional approach of the people of Crete, Greece, Southern Italy, and Spain, The Mediterranean Diet may be the least restricting diet out there, at least in my opinion. It is a heart healthy eating plan that includes fruits, vegetables, fish, and whole grains, while limiting those unhealthy fats. 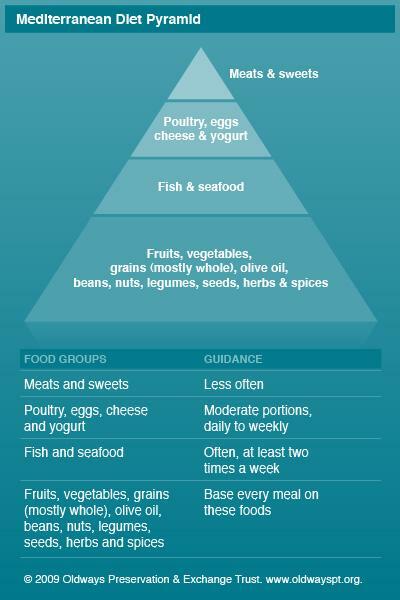 The Mayo Clinic’s site can describe the foods of the diet better than I could. In fact, they did with this picture. 1. Get plenty of exercise (A great component if you ask the ADA). 2. Eat primarily plant-based foods, such as fruits, vegetables, whole grains, legumes and nuts. 3. Replace butter with healthy fats such as olive oil and canola oil. 4. Use herbs and spices instead of salt to flavor food. 5. Limit red meat to no more than a few times a month. 7. Drink red wine in moderation (optional). These seven “rules” are the most loosely formulated diet rules you may witness in a weight loss eating plan. It works on the basis of overall health, limiting all bad foods, not just one type such as refined carbohydrates or fats. The diet gets a big fat okay from the ADA if going by their list of claims to avoid. The diet doesn’t promise melting weight away or limit you in many ways at all to a strict boring eating regimen, and still encourages regular physical activity. The Mediterranean Diet ranks as my favorite eating plan because it hits all the points of the basics for healthy weight loss touched upon by the American Dietetic Association. What are the basics you ask? Simple. 1. Make smart choices by choosing fruits, vegetables, whole grains, low fat dairy products, and lean proteins. 2. Get the most nutrition from your calories by eating healthy nutrient and mineral rich foods instead of refined sugars and junk food. 3. Balance food and physical activity for the most effective weight loss. The point of this blog isn’t to tell the reader what diets are best for them, but to give basic stepping stones and information on a few popular diet plans to steer them in the right direction for choosing the most suitable plan for their lifestyle and dietary needs. This entry was posted in Nutrition Facts and Tips and tagged basic, dietetics, diets, easy, exercise, food, health, housekeeping, loss, nutrition, science, simple, weight. Bookmark the permalink. Glad I could be of help and you enjoyed it! Check out next weeks diet reviews!